The British Gazette » Constitutional Reform in the U.K. 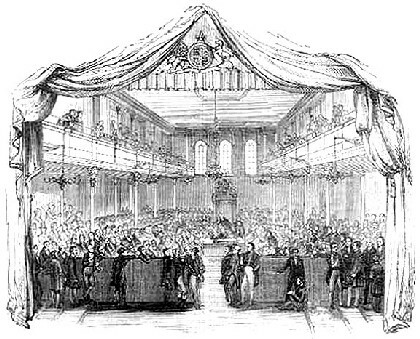 The above is a print of the first reformed parliament following the Great Reform Act of 1832. This long article by the Editor on the topic Constitutional Reform is based on the assumption that the United Kingdom of Great Britain and Northern Ireland remains as such. Sir Keith came out with the standard argument against PR – assuming that it was the “Party List” system I was advocating. To me, the issue appeared to be simple and straightforward – as “issues” do when you are 15. To me it was all about fairness. That people’s votes should be represented in the fairest and most balanced way. After the meeting Sir Keith came up to me and had a little chat and because I had not voiced any criticism of the other things he was saying and suggested that I join the Young Conservatives. Having had, like most teenage lads, become interested in girls – and experiencing that the interest so far as Yours Truly was concerned was not being reciprocated and learning that girls joined the “YCs” I joined, and finding none near my age left shortly after. I did not “renter” politics – in the sense of joining a political party/organisation until the 1980s, when my reasons for joining were political. Ever since that time I have held to the belief that the First Past the Post system was unfair and should be replaced. Although this belief has remained, experience and involvement in the politics of this United Kingdom has shown me that to enact what the Liberal Democrats want – to elect the House of Commons by the Single Transferable Vote – would damage politics in this country. Why? Because it would produce a semi permanent party of government – the Liberal Democrats – which of course is one but not the only reason why they espouse this. What we would have is coalitions, of the Labour and Lib-Dems and then a coalition of the Tories and Lib-Dems. Were either main party to seek to govern as a minority government it would have all the problems associated with such. The biggest problem with this entrenchment of the Lib-Dem vote would be the reaction of the British People. The British People are not terribly concerned about electoral systems and ideologies. The late Harold Wilson mentioned what most concerns the British voter in his “pound in your pocket” speech following the devaluation of the pound in 1967. What would infuriate the British voter would be a situation of “musical chairs” insofar as cabinet seats reserved for members of the Liberal Democrats following each and every General Election. The political facts of British political life are these: the British People like a government to govern. They like political parties to “do what it says on the tin” – in other words do what they say they are going to do. They like a clear decision. All these things are possible with First Past the Post (although not always achieved). They are not possible with Proportional Representation. It may therefore come as a surprise that I still advocate Proportional Representation! Not only do I advocate it, I advocate the most proportional system of the lot (replete with its disadvantages): the (closed) Party List. I also suggest a non transferable threshold of 5% before any candidate is elected. This is to prevent such as the Official Monster Raving Loony Party from sending candidates who are likely to be nothing more than eccentric publicity seekers. “Non Transferable” means that if a party does not reach the threshold there are empty seats and these are not shared out between the other parties. That is why I state “up to 500” and not 500. I also suggest that the Revising Chamber should be a permanent fixed term institution. It should sit for a four year (forty seven months in fact) fixed term from 1st July to the 31st May four years hence – regardless of the day of the week. The Election Day should be Midsummer’s Day 24th June – regardless of the day of the week. Ideally, in a Leap Year the next being 2012 (at the time of writing). Were these reforms introduced in time for the election to be held on the 24th June 2012, this would bring forth strong criticism from the Lord’s Day Observance Society. I have been in correspondence with them and they state that they are resolutely opposed to voting on a Sunday. I must state that on this issue I disagree with them as it seems that voting on a Sunday is traditional practise in continental Europe. If the Pope does not object to Italians (and RC Germans) voting on a Sunday, I don’t see what the problem is. In any event, the 24th June will be a Sunday next in 2040, 2068, 2096 and 2108. The above reforms would give this country a revising chamber that would accurately and fairly reflect the wishes of the British People. Sitting alongside the major parties (Conservative and Labour) would be the smaller parties (if they reached 5%). What the reforms would NOT do would be to create cabinet seats for any member of the revising chamber as I propose a Ministers of the Crown Act. This act would limit the Sovereign in their appointment of government ministers. The act would state (with certain exceptions these being the Lord Chancellor and the Lord President of the (Privy) Council) that Ministers of the Crown must be members of the House of Commons. I therefore turn the Reader’s attention to the House of Commons. The First Past the Post system currently used in the U.K. fails as it cannot fairly deal with three parties. In the USA where they effectively have two parties – Democrats and Republicans – the First Past the Post system works – and works well. In fact, Americans call the system “the two party system”. This emphasises the fact that the First Past the Post can only work fairly when there are only two parties. I suggest that the limitations inherent in the First Past the Post system be addressed by using the Second Ballot method of election. The first “twist”: One of the problems in British Elections is low voter turnout. The Australian answer to this is compulsory voting. It works. Very much in the manner of the GATSO camera. Few motorists – save for those in foreign plated cars – will knowingly break the speed limit in front of a GATSO camera as they do not want a £60 fine and three penalty points. By the same reasoning, few Australians fail to turn up at the polls on Election Day as they do not want to pay a fine. However, I do not propose making it compulsory for British Electors to vote in all three elections (Revising Chamber + Commons 1st & 2nd rounds). Instead I propose that only the 2nd (final) round of the Commons elections be made compulsory. This would in fact help the political process as the minor parties would realise that with a small voter turnout in the first round elections would give their candidate a greater possibility of coming second and therefore going through to the run off. This in fact happened in France when the Front National candidate Jean-Marie Le Pen got through to the second round as a result of a low poll. The second “twist”: this is connected with the first. Since the voter is required by law to cast a vote there MUST be an option made available to them if they do not wish to vote for either of the two “run off” candidates. Therefore there should be a “Neither of these” box – which we consider will very quickly become known as the “NOT box” or “NOTS.” This of course throws up a possibility which must be considered and planned for – even though it may be considered unlikely: were the results in such an election to mean that the number of “NOTS” exceeded the number of votes cast for either one of the candidates (NOTS 1st; Candidate A, 2nd and Candidate B, 3rd) then neither run off candidate should be elected and a writ would have to be moved in the new parliament for a by-election – the “First Past the Post” to be used here – compulsory voting not to apply. My preference would have been the Alternative Vote in these circumstances. However, following the comprehensive defeat of AV in the recent referendum, the peoples wishes should be followed. The implementation of a fixed term for the Revising Chamber allows for the continuance of variable term parliaments in the House of Commons. Given that the Revising Chamber will be changed every four years I would suggest that we could in the case of the Commons go back to a maximum term of seven years by un-amending the Septennial Act of 1715. A Prime Minister always should have the right to decide when to “go to the country”. U.S. Presidents suffer from the “lame duck syndrome” – I do not want British Prime Ministers to suffer similarly. Why 500 members? You may well ask. Well that great parliamentarian, the late Enoch Powell knew a lot about the workings of parliament and was of the opinion that 500 was the optimum number. Lower than this and one failed to have the breadth of talent and experience. Higher than this, it was difficult for members to, “catch the Speaker’s eye.” Therefore the British Gazette considers that Mr. Powell’s advice in this area of his expertise should be followed. To those still doubtful that 500 is too low a figure, we would point out that there will be up to 1,000 nationally elected politicians in total. That surely is enough! A big problem with British politics stems not from the way we elect our politicians but who we elect. The core problem are the politicians themselves. Back in the nineteenth century, after the Great Reform Act of 1832, British politics worked quite well. This was because those who took part in it were drawn from a small and exclusive group. British politicians were either scions of the great aristocratic families or rich and successful men who had “made a name for themselves” either in commerce or the professions. These were men of substance. Men of independent means. Most of today’s politicians are anything but. They are generally careerists. Sons and daughters of generally middle class parents who read politics at university, become political assistants and/or local councillors whilst working for a quasi-political organisation, such as a charity or a well funded pressure group/think tank, and then enter “paid politics” as a back bench MP. These young people are keen to climb the greasy pole of career success. The Miliband brothers are prime examples of this. If as a nation and a people, we want to improve the standard of politics and government we have to raise the standard of the personalities involved. One of the great old men of British politics Anthony Wedgewood-Benn famously said: “it is about politics, not personalities…” Well, Tony, you are wrong. It is about both. The trouble with this is that the solution to this problem is in itself unfair. But then life is unfair. One of the most obvious reasons for explaining the present voter disenchantment is the expenses scandal. This is in large part due to the fact that the MP’s are “money motivated”. This does not mean that they are necessarily dishonest. It means that they are like typical commission only salesmen. Interested in maximising their income. During the 1970’s in an attempt to placate public criticism, MP’s salary increases were scaled back and they were given the “nod and the wink” to make it up on their expenses. The way to improve the standard of MPs is to pay their travelling and accommodation expenses, provide their offices and staff funded directly by the taxpayer but not to pay them a salary. This of course will mean that being an MP will generally be the preserve of the wealthy. Clearly it will be vital to make sure ensure that there can be no “conflicts of interest”. This can be done by insisting on full public disclosure of their business and financial interests. This proposal will produce a huge amount of criticism. However, the Britain of today is very different to the Britain in the middle of the 19th century. There are now large numbers of people who, although not multimillionaires, are of sufficient means as to be able to undertake the duties of an MP receiving only their incurred travelling and other sundry expenses. There are many organisations, such as the trades union, Amnesty International, the Freedom Association and Greenpeace who would be prepared to sponsor an MP. The constitution of the United Kingdom has not only been breached; it has been broken. Many times and in many places. The original breach occurred long before the present traitors (Brown, Miliband et al) were born. The first major breach occurred as long ago as 1911 when King George V misguidedly gave the Royal assent to the Parliament Act which reduced the powers of the House of Lords. The Parliament Act of 1911 was the idea of the Asquith government. Frustrated – and quite justifiably so – by the unelected House of Lords rejecting the Finance Bill, the Liberals resolved to fix the problem by removing the Lords power of veto over the legislative process. This completely violated the constitution as the Bill of Rights is quite clear: the Monarch CANNOT enact ANY law without the CONSENT of Parliament. Parliament is defined as the Lords Spiritual and Temporal and Commons. This brings us quickly to the nub of this particular issue. In the English Legal tradition going back to Saxon days before the Norman Conquest, for consent to be legally effective it MUST be both FREE and INFORMED. When “consent” is held by the courts as not being Free and/or Informed it is held to be NUL and VOID. You have gone to Tesco in your car and are walking back to it with a bag of groceries when a youth accosts you, pulls out knife and asks you for your car keys suggesting that you have a choice of handing him the said keys or having your throat cut! Naturally you will hand the youth the car keys! Now then, ask yourself this question. Did you freely give consent to the youth taking your car? The 1911 Parliament Act – and inter alia the Parliament Act of 1949 – are unconstitutional as they remove the ability of the Lords to give consent as the ability to freely give consent means also the ability to freely refuse consent. This of course lands the county with a huge problem. Namely that as an unelected legislature the Lords can effectively block any measure the wholly elected Commons puts forward – including finance acts. A “convention” is not an abrogation or power – only a settled policy of not using the said power. A policy which can be revoked at any time. Clearly, this was a most unsatisfactory situation in 1909 when the crisis was at its height and now 100 years later would be even more unacceptable to have a major “first world” power with only half a democracy! In attempting to introduce further democracy into the system the Labour Party further violated the constitution by implementing the Parliament Act of 1949. Of course the most monumental of all constitutional breaches took place in 1972 with the passing of the European Communities Act by the arch-traitor Heath and subsequent treaties by the other arch-traitor prime ministers that culminated in the European Constitution and the Lisbon Treaty. We all know that Messrs. Blair and Straw set their hands to the text of the European Constitution. Messrs. Brown and Miliband set their hands to the text of the Lisbon Treaty. Of course, these four arch traitors would attempt to argue their way off the gallows (by presenting the legal argument of International Recognition. NB: the British Gazette DOES NOT support the death penalty and most certainly does not think that these four should be hanged! More explanation is required here. Consider the following hypothetical scenario. There is a banana republic called, Las Islas Americanas. It was ruled by a Presidente James Marrón (Spanish: brown). El presidente is overthrown in a coup d’état by General Juan Paja (Spanish: straw). What happens is Paja’s men seize the radio station and the airport in the capital and declare themselves the new junta and issue a statement along the lines of the predecessor being corrupt, in league with foreign powers &C. General Paja installs himself in the palacio presidencial and becomes Presidente Paja. Presidente Paja’s first act is to issue a new constitution which contains a statement why he General Paja has seen fit to take over the reigns of government and then sets up an apparatus of government that pleases him. Now for a question. How does General Paja’s actions become legal? Answer: by the practise and established convention of International Recognition. In other words foreign governments recognising the new junta. Now let us suppose that Paja’s junta lasts and that Presidente Juan Paja V is the fifth incumbent – the presidency is for life and hereditary – when a legal challenge is issued to a presidential decree. All the Paja presidents have each declared that they rule by the constitution issued by their original predecessor Presidente Paja el grande (the great). What should happen in these circumstances is that the courts (of Las Islas Americanas) should rule on the basis of whether there has in fact been a violation of the Paja constitution. Crucial to the success or failure of the legal case will be the statements of the incumbent administration. If the administration declares the Paja constitution to be valid and extant and claims to rule by it, then if that constitution has been violated such violation must be corrected. Please note the capitalised text. This is fundamental as the present sovereign through the treasonous actions of her ministers has abdicated the government of the country. Furthermore, by implementing EU Directives (laws) by statutory instrument the monarch again by the treasonous actions of her ministers have executed laws by regal authority without the consent of parliament. These treasonous felons have well and truly “cooked their goose” by various authorities confirming the Bill of Rights as still extant. Passing over the issue of the government of the county being handed over to a foreign power – the European Union – these incompetent, felonious and treasonous persons have further violated the British Constitution by the reforms of the 1990s removing the rights of hereditary peers to sit and vote in the House of Lords. This begs the question: What can and cannot be done in terms of the makeup of the House of Lords? The answer is quite simple. The sovereign – please note that all government and legislative actions are said to be actions of the sovereign even though it is accepted that these actions are those of the sovereign’s ministers – can add to the membership of the Lords but cannot without good reason subtract from it. That is to say, she can create peers but if she removes the rights of peers that is an attack on the rights and privileges and powers of the Lords. What is good reason – you ask. That hereditary peers are not elected and therefore should no longer be allowed to sit and vote? No. Whilst many may well share the democratic sentiments behind this statement it is not in constitutional terms a valid argument. That a hereditary peer convicted of a felony should be disqualified from sitting and voting in the Lords? Yes. This would be a constitutionally valid reform. Such a disqualification however could only be applied to the peer in question. The peer’s successor could not be so prevented – unless he too had committed a felony. It may therefore be thought by many – Europhiles in particular – that the constitutional difficulties presented by the Declaration and Bill of Rights of 1688 and 1689 could be dispensed with by amending or repealing the same. NO. This is where the Europhile traitors come to realise the sheer size of the hole they and their predecessors have dug for themselves! You see, the Declaration of Rights is more than a treaty. It is more than a written constitution. It is the very essence, the absolute keystone in the middle of the arch keeping the whole settlement in place. Remove or amend this and chaos ensues as legally and constitutionally the Declaration and Bill of Rights of 1688 and 1689 ARE INCAPABLE OF BEING REPEALLED OR AMENDED! Those who doubt this should ask themselves this: Since the Declaration and Bill of Rights causes the Europhiles such problems, why have they not repealed same? Answer: BECAUSE THEY KNOW THEY CANNOT – OTHERWISE THEY WOULD HAVE DONE SO! Because it is the Declaration and Bill of Rights which bestows the legitimacy and legality to the Queen’s government and her seat on the throne. Repeal or amend these and the Heir Generals to the Jacobite throne have a lawful claim! Is there a solution for them then? Yes. In fact there are two. The first would be to declare a republic, issue a new republican constitution and await the recognition of foreign governments. The second would be to issue a new Declaration of Rights that would denounce the provisions of the 1688/89 documents. To be valid however it would have to declare the desirability of placing the United Kingdom as a suzerain power to the European Union. In other words, whereas the 1688 declaration gave as its reason [for the coup] the abdication of government by the predecessor ruler [James II] and the wish of the new regime to repossess the government of the state – the new declaration would have to expressly state that the reason for the coup – and the new declaration – would be the desire to abdicate the government of the country to the European Union. This way the country could retain the monarchy. As all Eurorealists know, the Europhiles have from before the UK joined the EC/EEC/EU the pretence that no (later limited) cessation of sovereign power was entailed. They have been perpetrating a deception for decades. They would have to perform a very public volte-face. So, assuming the UK leaves the EU and restores lawful government, how do we proceed to establish a fully democratic government and legislature? Since any proposals to restrict or reduce the power of the unelected house are unconstitutional and any attempt to “democratise” the Lords by removing or restricting the voting rights of peers is similarly unconstitutional as it would be an attack on the house and its privileges and proposals to replace the Lords with such as elected “Senate” is equally difficult as the 1688/1689 Declaration/Bill of Rights, which as the keystone document of the British constitution has effectively embedded the description of parliament as “the Lords Spiritual and Temporal and Commons at Westminster in Parliament assembled” what do we do? This is to further adapt the British constitution in certain important areas. Since these documents were the instruments by which parliament had staged a coup d’état and removed the lawfully crowned King James II from the throne by declaring, “….whereas the said late King James the Second [James Stuart was alive at the time of the declaration: “late” referred to his constitutional “death” not physical death] having abdicated the government and the throne being thereby vacant….” The effect of any repeal or substantial amendment to nullify any major part of it, would cause the successors of William and Mary, including the present monarch would be to invalidate their right to sit on the throne as repeal would be to reverse the coup. This being the case, a workable and constitutionally valid method has to be found. The solution: Whilst the 1688/1689 Declaration/Bill of Rights can not be repealed, amended or even replaced, a “substitute” could be enacted which “may henceforth be used in place of the aforesaid Declaration/Bill.” As long as the effect of any such substitute did not contradict the terms of the 1688/89 Declaration/Bill, the constitution will not have been violated! The British Gazette therefore proposes setting up a body by way of adapting an existing body, the ancient Privy Council. We proposed a Privy Council Act which would set up a “Legislative Committee of the Privy Council” This would create a body where privy councillors would be appointed by the sovereign for a term of four years and would be able to act as an alternative chamber to either the House of Lords or the House of Commons. Thus, in order for the monarch to enact a law such a law would first have to gain the consent of, the House of Lords and the House of Commons (the existing situation); the House of Lords and the Legislative Committee of the Privy Council; or the House of Commons and the Legislative Committee of the Privy Council. Furthermore, if the monarch wanted a “belt and braces” approach they could even seek the consent of all three! At first glance the proposal would appear to be merely replacing an unelected hereditary chamber with an unelected appointed chamber. This practically is not going to be the case, it is just that due to the antique vagaries of the British constitution, democracy is practised as a “convention” not as a constitutionally guaranteed right. Therefore the Privy Council (Elections) Act would be passed shortly afterwards. There is a reason for enacting the legislation in stages. It was envisaged that there would have to be five stages. 3. Enactment of the Privy Council (Legislative Committee for the UK) Act: This would set up a Legislative Committee of the Privy Council that would have the Lord President of the Council as its Chairman and ex-officio member who would subsequently recommend to the monarch the appointment of existing privy councillors and/or persons, other than those presently members of the House of Lords or the Commons. The act stating that peers “who have taken their seats” in the House of Lords and members of the House of Commons could not be members of the new committee, but with a singular exception stating the Lord President was henceforth to be a member of the Lords. This is to enable the Lord President as Chairman of the Legislative Committee to sit in the Lords at the state opening of parliament. Thus, when the monarch has delivered the gracious speech the Lord President is in a position to relate its contents to the committee. Of course, it is possible to communicate such details by email but the monarch has to be seen addressing the Lord President. In addition, the committee would also have members appointed by Secretaries of State for Northern Ireland, Scotland and Wales. The Act would provide that the legislative committee sits for a four year (forty seven months in fact) fixed term from 1st July to the 31st May four years hence – regardless of the day of the week. If a peer who had taken his seat in the House of Lords wished to become a candidate in the elections for the legislative committee then they could do so. However before being able to be appointed they would have to petition the sovereign, through the Lord Chancellor for a “Writ of Absence.” This writ would last for a period of forty seven months – the length of the legislative committee term. The effect of the writ would be to exclude the peer from being able to attend, sit and vote in the Lords. Had a peer succeeded to a peerage or having had a peerage bestowed upon them had not taken their seat in the Lords, they would be able to be appointed to the legislative committee without the need for a writ. In all of these cases, if the peers were not privy councillors they would have to complete the “stat-dec” [see 4. below] in the same manner as all other candidates that were not privy councillors. 4. Enactment of the Privy Council Elections Act: The purpose of this act is to provide appointment lists of privy councillors and other persons to the Lord President of the Council, and the Secretaries of State for Northern Ireland, Scotland and Wales, to be recommended to the sovereign for appointment to the legislative committees in the case of privy councillors and in the case of other persons, for their appointment as privy councillors and subsequent appointment to the legislative councils. This is an important aspect of the Act as privy councillors are the monarch’s privy council and not the electorate’s. The act should institute elections using the Closed Party List System of proportional representation for Legislative Committee for the UK. The elections to be held on 24th June every four years – regardless of the day of the week. Since the closed party list system is being used it is to be hoped that political parties would exercise a degree of sound judgment as to who they would put on their lists. The purpose of the statutory declaration is to put a legal onus on all appointees, realising that to make a false declaration was perjury and if convicted, they could (and probably would) be sent to gaol. The other obvious effect is that if they are unable to make such a statutory declaration they would become ineligible for appointment, in which case the next person on the party’s list would be able to take that person’s place. Up to 500 people should be elected to the new legislative committee: there should be four national constituencies; England, Ireland, Scotland and Wales with the number of members in proportion to their populations. However, as with the House of Commons, a degree of over-representation should be accorded to Northern Ireland, Scotland and Wales. However, to answer the “West Lothian question” post devolution, the Conservative party’s suggestion that the voting rights of these members should be restricted in line with the devolved competences would be taken up. Importantly, there should be a 5% “threshold” for any party submitting candidates. The 5% threshold is because that were there no threshold many minor “fringe” parties would be able to send privy councillors with either extreme or eccentric views, personalities or a disturbing combination of all three. The effect of the threshold is singular in its operation. Parties obtaining in excess of the threshold would receive a number of seats in precise proportion to the vote. For example were the Conservatives to get 32% of the popular vote in the English constituency 32% of their list would be appointed. Were say, the “Flat Earth Party of Middlesex” to receive 0.5% of the popular vote, none of the persons on their list would be elected, nor would those empty seats go to any other party. The seats would remain empty. Were a large number of minor and “fringe” parties to stand for election and receive up to 4.9% of the vote there is the potential that a substantial number of voters would not be represented and that the 500 seats, and particularly the seats in England would remain unfilled. 5. Enactment of the Deprivation and Disclaimer of Peerages Act: This would repeal the Disclaimer of Peerages Act, 1963 and provide for a Writ of Deprivation to be issued by a court to remove a peerage from a peer convicted of a felony offence. In the case of a hereditary peerage this would have the effect of such a peer disclaiming his peerage voluntarily. The issuing of such a writ is to be a discretionary act on the part of the trial judge – if that judge concluded that the offence merits such. Since the issuing of such a writ would be held to be forming part of the punishment, the writ could be appealed to a higher court. In addition the act would enable any peer (in any of the five peerages of England, Scotland, Great Britain, Ireland and the UK) whether they held a life peerage or a hereditary peerage, or whether or not they had been created thus or had succeeded to it, to disclaim the peerage. In the case of hereditary peerages such a disclaimer would last the lifetime of the former peer and upon the former peer’s death the peerage would come into being again as the heir to the peerage would succeed to the disclaim peerage on their parent’s death. There would be no time limit. A peer could disclaim the peerage at any time. Pros and cons and implications of the reforms. The biggest potential “Con” is that the House of Lords is necessarily effectively unaffected. It would be restored to its 1910 powers and membership. The new Bill of Rights would not impair the functioning of the 1688/89 enactment in any way. This would mean that when a Bill proceeds from the Commons to the new legislative committee the House of Lords would have to be advised of that the Commons by a vote have decided to send the bill in question to the legislative council and not the House of Lords and that should the Bill be approved by the legislative council the government has no intention of submitting it to the Lords at that stage but will petition the sovereign for the bill to receive the Royal Assent and become law. For the “proper practice of the legislative process” not only would the House of Lords have to be advised of such, it would formally have to be given the opportunity of agreeing or disagreeing that its legislative role be bypassed for should the House of Lords disagree with this it will be fully within their rights to demand that the Bill is sent to them for their consideration and approval. The way this would work in practise would be that when a Bill has finished its course through the Commons it would be presented to the Lords where the Lord Chancellor would propose that (“the other place” [the House Commons] wish that the Bill be passed to the “Leg-Com” and the Lords waive their right to debate the Bill be put to their Lordships. At this point it would be expected that their Lordships would agree. We would also prefer it if the House of Lords could be found a proper role apart from its traditional role of being the supreme court. Well there happens to be one. Central to the workings of the British Constitution is the link between church and state. Indeed this link and the religious strife it has caused through the centuries is a hallmark of “the British way of doing things.” Mercifully the inter Christian divisions on mainland Britain at least seem to be a thing of the past. At this point we would point out that we support in principal and in practise the freedom of religion in the UK and have no problem with persons of whatever faith (or gender or ethnicity) holding elected office and positions in government and public administration (including Justice). However, there is one area where the reintroduction of a form of discrimination would assist the “proper practice of the legislative process.” This is in the membership of the House of Lords. - Life peers created under the Appealate Jurisdiction Act of 1876. The problem is this: following the reforms, the House of Lords would be restored to its proper role of supreme court. But what of its former legislative role? Is it to be permanently sidelined? We propose not. Instead we propose that it should serve as an additional and higher debating and legislative chamber of the Church of England. At this point we will have the politically correct climbing the walls and foaming at the mouth. This reaction however would be to misunderstand the objective of the act. The acts objective is not to discriminate against a person on religious grounds. It is to allow for the creation of a properly constituted debating and legislature for the Church of England. The reader has to ask themselves this question: If there is a debating and legislative chamber set up specifically for the Church of England, why would a Christian of another denomination or a adherent of a different faith entirely (or an atheist) wish to be a member of such a body? To enhance the House of Lords in its new role we would also propose the repeal of the Bishopric of Manchester Act of 1847 limited the number of places for Lords Spiritual to 26. There are 44 dioceses in the present-day Church of England and we suggest that all these clerics should be able to sit and vote in the revised chamber. These reforms clearly raises the possibility that the House of Lords may in fact decide to review a bill. Were the House of Lords to intervene on any bill to frustrate or amend its passage, the solutions to this problem are twofold. One public opinion – a hereditary chamber (composed of members of one particular Christian denomination) demanding to intrude on the democratic process would be deemed unacceptable by the public. Two mass creation of peers (who would have to be communicants of the Church of England). Note: putting such a Bill before the “Leg-Com” subsequent to the Lords dealing with it would be a breach of the Bill of Rights as it would usurp the power of the Lords. To avoid any prospect of the House of Lords feeling itself able to adopt its traditional role of revising chamber is a principal reason for the restrictions on the religious denomination of most of its members – such an unrepresentative and unelected body could not possibly hope to find any form of public support for such a move. A “Pro” is the implementation of a fixed term for the legislative committee which allows for the continuance of variable term parliaments – up to a maximum term of seven years – the Septennial Act of 1715 being un-amended. A Prime Minister always should have the right to decide when to “go to the country”. U.S. Presidents suffer from the “lame duck syndrome” – we do not want British Prime Ministers to suffer similarly. This would mean that over the course of its term, a government would likely be faced with a mid term election in the legislative committee. Furthermore due to the nature of the proportional voting system it is extremely unlikely that the government would have a majority on the committee. This would mean that they would have to argue their case and or compromise – make deals and concessions. This of course is the inescapable price of proportional representation. This system would however mean that because the legislative committee would not be the chamber from which the government draws its mandate one of the biggest drawbacks to a parliamentary use of proportional representation would be avoided. That is where a minor party or parties, holding the balance of power can and do demand a seat or seats in governments and/or specific policy pledges from governments. This gives them an influence out of all proportion to the size of their vote. Under further proposed reforms this need not happen. Having the legislative committee elected using proportional representation however would stop the worst excesses of “the elective dictatorship” that is the current British parliamentary system. Many persons will suggest that another “Con” is the use of the Closed Party List System. They will state that the Party List severs the link between those elected and the elected – no constituency in other words. They will also state that the Party List allows the party leaders to decide who sits in the chamber. In rebuttal we would suggest that these critics should realise that this is to be a revising chamber and therefore the constituency link should not apply. That should be a function of the House of Commons. Furthermore, the choosing of those elected by the party leaders is precisely what is required as the party leaders are expected to choose wisely. If they don’t then the people will be their judge. Electing the Legislative Committee using the Closed Party List will have one inevitable consequence. No one party will have an overall majority. Since the legislative committee will have equal power with the Commons this raises questions about electoral reform for the Commons. Overall, we feel that this new tri-cameral system would give the country a fully democratic system that would combine the advantages of a government with a clear majority in the Commons but with the requirement to seek compromise and consensus from the Legislative Committee of the Privy Council with its spread of parties. So far as the House of Lords is concerned, its chief role would be the reversion to the role of the nation’s supreme court following the reorganisation in the nineteenth century – the Appellate Jurisdiction Act, 1876. The Blairite Constitutional Reform Act 2005 done at the behest of the EU has of course to be swept away. The reason the EU put forward for the change was to ensure the separation of roles of the Lord Chancellor – part politician part judicial executive. Our proposed reforms have effectively done what the EU wants as the Lord Chancellor will henceforth perform his judicial role as the Lords will no longer transact significant legislative business. The problem of the broken British constitution has been something of a “hobby horse” for us. When the Blair government invited the public to give their suggestions on the reform of the House of Lords, we had come up with a suggestion which seemed a very attractive and elegant solution to turning the House of Lords into an effectively fully democratic chamber. Unfortunately, it had a fatal flaw: it was illegal!!!!!!!! The suggestion was to create another type of peer: Lords Civic. Do not misunderstand this, we do not mean a new degree in the peerage. To explain: currently there are two (and due to the 1688/1689 Declaration/Bill of Rights there can be only two) types of peer, the Lords Spiritual and the Lords Temporal. The Lords Spiritual are the archbishops and bishops of the Church of England. The bishops have sat in the House of Lords since it was founded in the middle ages. Although they have always sat as the Church of England, up till the reformation the Church of England was part of the Church of Rome. These peers can be described as ex-officio peers, that is to say they sit there when they hold the office of bishop. Should they ease to be bishop they no longer have a seat and vote in the Lords as that seat and vote belongs to the bishopric and not the human being currently occupying the position. The Lords Temporal are the hereditary and life peers. These people have (had in the case of hereditary peers) a seat and vote in the Lords. In the case of hereditary peers the peerage did not die when they died but passed to their heir. Both Lords Spiritual and Lords Temporal have one vote – this is the case of one man (or woman since 1963) one vote. This applies regardless of rank or number of peerages held. Thus for example, the Archbishop of Canterbury has one vote. So too does the Bishop of Durham. Although Canterbury outranks Durham this does not entitle Canterbury to an extra vote. Similarly, the Duke of Devonshire is also the Marquess of Hartington and Earl of Burlington. This does not mean that he has three votes. Only one. Similarly, Lord Mandleson is a mere Baron. Yet despite his “lowly” status in relation to the Duke of Devonshire, Devonshire would have had no more voting power than Mandleson. The Lords Civic was going t fundamentally change this balance. The suggestion was to pass an Act of Parliament that would create the Lord Mayors of our cities Lords Civic. That is to say that like the Lords Spiritual they would sit ex-officio in the Lords. Lord Provosts in Scotland would be affected similarly. Furthermore it was envisaged that the Act would also create the office of Lord Sheriff – that was to be the equivalent of the Lord Mayor but for the traditional counties of England, Scotland and Wales. In all of these cases the incumbents would only be able to sit and vote in the Lords for as long as they held the office. The Act would also significantly change the role of the Lord Mayor and Lord Provost. Currently they are essentially honorific roles. The Act would cause them to be elected directly by the people. NB: Do not confuse this with the current elected executive mayors of cities such as London and Doncaster. The suggestion was that the Lord Mayors, Lord Provosts and Lord Sheriffs would be elected by the people to represent their city and county in the House of Lords. The major change introduced by the act was to introduce a complete new paradigm to the House of Lords. This was by the introduction of the concept of the “block vote”. Most readers will think of Labour party conferences with Trades Union leaders holding up cards giving them a number of votes equal to the number of their union members. The proposal was to introduce this concept to the Lords through the Lords Civic – each Lord Mayor, Lord Provost and Lord Sheriff would have a block vote equal to the numbers of people resident in their cities and counties at the last census. This way the individual votes of the Lords Spiritual and Lords Temporal would be rendered wholly insignificant! Result: Democracy would be introduced to the House of Lords! Unfortunately, this reform can not be done as it is unlawful. Why? Because any reform to the British Constitution CANNOT violate the provisions contained in the 1688/1689 Declaration/Bill of Rights – for the reasons mentioned in the article. Does this mean that NO reform can take place? NO. Importantly however any reform MUST NOT conflict with the Declaration/Bill. Effectively this means that any new institution or creation must have existed at the time: 1688. In other words, to set up a Legislative Committee of the Privy Council is allowable as the Privy Council was in existence at the time and it was conceivable that the members of House of Lords could possibly have agreed to an addendum text to the Declaration/Bill that allowed the Sovereign to seek the consent of such a body – but ONLY on the basis that the House of Lords would agree to such and for such to be on a case by case basis. This is where we have a problem with Lords Civic. You see, whilst it would have been possible (probably unlikely that they would – but that is irrelevant) that the folks back in 1688 to agree to such a proposal, it is impossible to create Lords Civic because Lords Civic did not exist at the time and are not mentioned in the Declaration/Bill as a result. Peter, this is an awesome article, and more to the point, urgently needed. Groups of patriots all over the country should be able to united behind this reclaiming of our lawful rights and freedom. Hanging was abolished, as was the death penalty for treason, by men and women actively engaged in sedition and treason. At the very least they should be put on trial and if convicted, stripped of their property and jailed. I’m not sure if you are aware, but the 25 hereditary Barons, have appointed 4 Barons, as stipulated in Magna Carta, to summon the Government to trial. No Judge has come forward to accept the evidence of treason, we will have to remove many of them too.